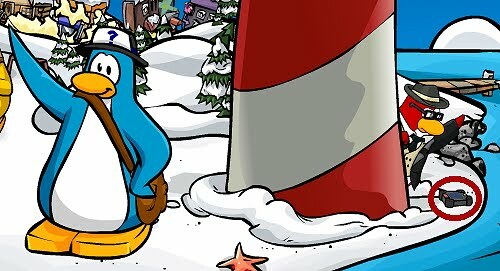 Club Penguin Cheats by Mimo777 Club Penguin Cheats by Mimo777: Club Penguin Homepage Update! Do you think we will soon get one of these devices and the cool new EPF outfit when the new HQ is finished? yeah i hope we don't have to pay to be a secret agent too! Oh no! Not for members only I hope! I think there might be another quiz to get the new gadget. Hopefully there wont be a members only room. the new EPF suit isnt that cool. the PSA glasses are cooler and so is the suit but the hat is kinda cool. And popcorn in the homepage! OMG!!! is that jet pack guy? what is with his outfit?! yeah i hope that we can teleport places with the new gadget phone and, it will also be a cheese dispencer. or popcorn, which actually, makes more sense than a cheese dispencer. lol. Ok. I was playin through the new mission again and i was in the gift shop. I went by Jet pack guy in the office. Look in the tool box. See a recognizable friend? The flashlight we used to save G in the Club Penguin Elite Force DS Game. I think this is just yet another clue of the ePF becoming the main Club Penguin Spy Agency! i love mimo777 and i hope that we don't hane to pay to be an agent. I can't wait intil we get the new spy phones. I still think the PSA agent there looks better but it's pretty cool. Yea I hope it't not for members only even though I am a member. I wonder what gadget that agent is picking up. Hmm. Going to go hmm to myself for now... bye! Mimo you said you didnt like it when club penguin gave out the same free items, ask club penguin to just give out more free items lets say at the "Holiday party"
I think only people who buy the DS game will be able to become EPF agents. I would be a bit irritated if it's only for EPF players, but I'll be outraged if it's only for members. Club Penguin destroyed the PSA.. along with the old times of the secret way to become a Secret Agent, and with the fun but sometimes slow-to-release missions, Gary's entertaining gadgets (at least they'll be moved to EPF, right? ), etc. I hope normal Club Penguin players (non-member and non-EPF-owner) will still be able to enjoy the things in the above paragraph..
*sighs*. Club Penguin isn't as great as it used to be. Yes, that does actually look like Jet Pack Guy... he probably moved to EPF. That probably will happen to (all?) the PSA agents..
hey mimo the community page changed also! I think the PSA outfit is way better than the new EPF one. It looks cooler (I think). if all PSA members become EPF and get a new spy gadget do u think we will at least get to keep the spy phone in our inventory? i hope we do! the HQ is not over i mean SPF becuse if it was then all the nonmembers and new kids will not be abile to do the old missions, and if it is that means that EPF is for nonmembers to cuz new kids have to do the old missions to right? p.s. srry bout the long comment. Or they could make cheese flavored pez to put in pez despensors. Wow! It is! I hope that EPF will have stuff for non-members too, or at least people who don't own DS. I used my friends EPF to check the flashlight. Mimo said that the sports shop will be moving to the ice rink or snow forts. I really really hope that the new missions won't just be for members..or I WILL BECOME A MEMBER. Mimo check out the new pin! The creaming soda barrel what's it got to do with the game? Who do we know that LOVES creaming soda? ROCKHOPPER!!! He must be coming! Thank you for sending us your feedback. I will answer questions in the order they came. 1. For Holiday parties, we have recognized that some holiday parties are not celebrated all around the world, and we have instead, tried to create new parties, in which all penguins can take part in. However, we are trying to create the game around the feedback we receive from penguins. Nothing is for sure, and you may experience some of the missing Holiday Parties this year, in the future! 2. It is true that the Easter Scavenger hunt did not happen this year. There has been so much new content coming in to Club Penguin, we really did not have any place to put this scavenger hunt. Instead we created the Recycle Hunt, for the Earth Day Party. What did you think of it? 3. Club Penguin membership includes a lot more of the game than if you had a free penguin. We have decided to focus on this, giving the member penguins more privileges, as a "Thank You" for keeping the web-site running. We do not rely on third-party advertisements for income, we instead use memberships to keep the site running. 4. I will definitely make sure to pass along your feedback to lower prices on Club Penguin. Sometimes it can be really hard making a certain amount of money, only to have it spent on a few items! I will also pass along your feedback regarding more missions and more frequent famous penguin visits! We really do appreciate your feedback, if you have any other concerns, or suggestions, feel free to let us know! Just a friendly reminder that you should only use dinglejoe (CPG mod) if youre actually modding. Anyway, that is a coolerific idea! There will definitely be an extension to the new HQ if you buy the DS game, just like the Old HQ, but I don't think that they would make it just for members since it is one the most popular and favorite activities of penguins. If they had it members only, they may lose a good handful of non-members, who help support the site with advertisement to friends and family to play CP. These are my predictions, and I agree with Dingeljoe, there will most likely be a new quiz. More Fun! hey mimo remember back in mission 3 case of the missing coins and when you beat it you get the blue prints to the electro magnet 2 well if you look at it now its the bluprints to the electro magnet 2! Wow! I just figured out the guy who picks up the phone! I'm so stupid, just so stupid. It might be the director! I mean think about it, this is the perfect time to show his face! if we be epf secret agents can we get paid higher than 250? and i wish it's for everybody not only for members. Weird glitch! On some computers it still shows the Jet Pack Guy and the original Spy phone! Weird! That is so cool! It's good to know CP actually does listen. I agree with most of the answers he gave too. Thanks for sharing the response with us! I think he said that only the catalog will be moving to the Ice Rink. heyy heyy heyy us members pay for the clothes and stuff so we should kinda get more extra cos we payed real money for it! >:/ :) thats why we pay but cp will be cutting down because u want it all free that would be wasting our money - and would u like to spend money on nothing? huh huh lol < weird there. Same goes for people who payed for EPF games - they have to mace there money.. Yes I know, but I was talking about the building itself.